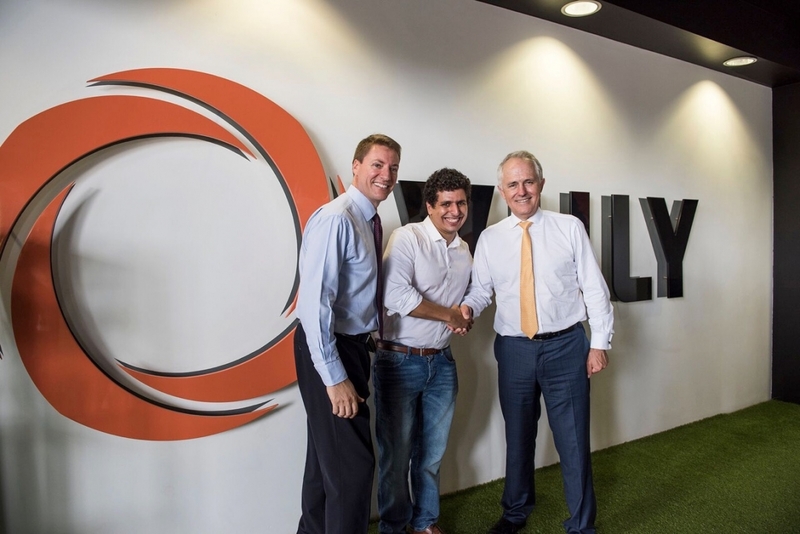 Ross Vasta MP, Federal Member for Bonner, Joe Andon, CEO Vuly Trampolines & Prime Minister Malcolm Turnbull touring Vuly HQ. Joe Andon’s obsession to build a global trampoline empire has caught the eye of Prime Minister Malcolm Turnbull, who visited the young entrepreneur’s headquarters in Brisbane. Mr Turnbull said innovative companies, such as Joe Andon’s Vuly Play, shows Australia has a bright future. In 2015, Vuly signed a deal with Spin Master, the world’s fourth largest toy maker, to distribute trampolines in the United States, Canada, Mexico and Europe. Spin Master produces Meccano and NASCAR toys. Vuly trampolines are also sold in Russia and the Middle East. In Australia, Vuly trampolines and a wide array of trampoline accessories are sold in many major outlets, including Toys ‘R’ Us, Bunnings, Harvey Norman Big Buys, Sportsmans Warehouse, go and play, Country Cubbies, instant fun online toys, among others. Mr Turnbull and federal member for Bonner, Ross Vasta MP, watched a video presentation on a company that was founded in Andon’s bedroom eight years ago and now generates tens of millions of dollars in revenue each year. Mr Vasta said on April 12, 2016: “Vuly is exactly the kind of company Australia can be proud of – a young company owned by a remarkable young individual with innovative ideas. “Joe has been able to revolutionise the way trampolines are thought of, and the way they can be used in the future. “He’s had the fortitude to put into practice his ideas. Through a lot of personal expense and hardship, he’s been able to break through and now Vuly is an internationally renowned manufacturer receiving orders from all over the world. During a tour of Vuly’s head office and research laboratory in Brisbane, Mr Turnbull praised Vuly employees and 27-year- old Andon for their innovative spirit and for being an example of outstanding Australian entrepreneurship. Andon said Mr Turnbull and Mr Vasta were enthusiastically interested in Vuly’s operations and how the company had grown to compete on the world stage. Andon said Mr Turnbull encouraged us to grow Vuly in Australia and abroad by finding new markets. “I found Mr Turnbull to be most supportive of Australian companies prepared to innovate and compete on the international stage,” Andon said. In late February 2016, Brisbane Lord Mayor GrahamQuirk visited Vuly’s offices, saying the company had contributed to Brisbane’s jump on the Global City Innovation Index from 85 to 60 in 12 months. “What I’ve seen here (at Vuly) today is really that excellence that’s creating our city as one being recognised for its innovation,” Cr Quirk said. Vuly’s success has been the subject of a case study published in a book entitled, Innovation and Entrepreneurship, by Melbourne University academics Professor Danny Samson and Dr Marianne Gloet. Oxford University Press is the publisher. The book, focusing on innovation and entrepreneurship in Australian business, is aimed at postgraduate business students and the broader business community. Andon said Vuly was built on innovation and innovation would propel it in future. Andon started Vuly at 19 after identifying a wide open niche in the trampoline industry he couldexploit. In 2008, he viewed trampolines as a museum piece, crying out for fresh designs, more accessories and an aesthetics makeover. He was determined to make safer, high performance trampolines that were easy to assemble. Vuly introduced leaf springs to its Thunder model trampoline, offering a bounce far superior to the traditional coil springs it replaces. And importantly, Andon says when kids do fall over on a Vuly trampoline, there’s no solid surface for them to crash into, no springs to get caught in and no frame to hit. The Thunder’s suspension – two rings of solid steel – is the same used in cars, trucks and planes. To simplify assembly, Vuly introduced a unique pop lock frame and T-join technology to replace nuts and bolts. This avoided customers from becoming frustrated while searching for a nut and bolt dropped in backyard grass, or from holes in frames drilled in the wrong spot. Vuly’s innovation has been rewarded over the years. In 2014, Andon won a BRW innovation gong at the BRW/GE Capital Mid-Market awards. He was a finalist in the young business person of the year category at the 2014 Lord Mayor’s Business Awards in Brisbane. Vuly’s Thunder model won a good design award in the sports and leisure category at the International Good Design Awards in Sydney. Vuly has won several Toys ‘R’ Us awards, among others. If you'd like to publish an article about Vuly, we're happy to help. Let us know on press@vulyplay.com, or call us on 1-800-467-1421.